About Us – Connecticut Professional Genealogists Council, Inc.
CPGC began in 1993 and has more than sixty members who work as genealogical researchers, writers, publishers, instructors, lecturers, managers of genealogical records, and genealogists serving heritage and lineage societies. Our members are independent professionals who conduct genealogical and historical research for clients ranging from individual family historians to television producers. All CPGC members agree to abide by our Code of Ethics. 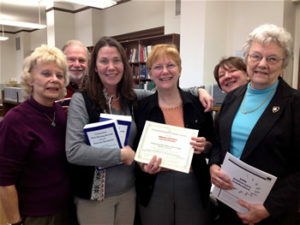 Through the Donna Holt Siemiatkoski Acquisition Fund, we give annual awards of genealogy publications to Connecticut genealogical repositories. We partner with local community organizations to present Ancestors Roadshows at which we help family historians make new genealogical discoveries. We engage with government officials to influence state and local legislation that impacts the genealogical community. We offer professional development to our members through our programming activities. CPGC is a 501(c)(3) organization. CPGC’s second President, Warren Buchanan, initiated this legislation and worked to get it passed in 2000. This important Act provides funds to cities and towns for the restoration and preservation of original historic records housed in town clerk offices. A $3 fee on deeds has raised over $20 million to save and preserve records at the town and state level. We diligently continue our activism with other such legislation.